"While many of the more than 5700 undergraduate students at Washburn University in Topeka, Kansas fall into the "non-traditional" category, each one has access to a broad liberal arts education. Washburn offers special programs for adults and commuter students in conjunction with area community colleges as well as a variety of courses, including one on the X-Files TV series." Describe the type of student who should not attend Washburn University and explain why. Describe the type of student who should attend Washburn University. Why? What is a typical Washburn University student like? Describe the type of person that should attend Washburn University. What are the top 3 reasons someone should attend Washburn University? Great law school if you want to be a lawyer. Campus is easy to get around. The acceptability of people with each other is wonderful. What was a typical Washburn University student like in high school? Describe the type of person that should attend Washburn University. The type of person who should attend Washburn University is a person who deeply values safety, diversity, and racial, sexual, and gender equality. 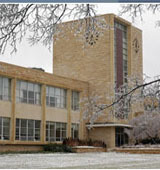 Located on a 160-acre campus in the center of Topeka, the capital of Kansas, Washburn University offers more than 200 programs leading to certification, associate, bachelor, master's and juris doctor degrees through the College of Arts and Sciences and the schools of Applied Studies, Business, Law and Nursing. Washburn's broadly-based liberal arts and professional education programs are enhanced by the tradition of an interactive relationship between campus and community. What are the top 3 things that students do for fun at Washburn University? Campus housing is available for undergraduates. Housing deposit : $200.00. Housing deposit is partially refunded if student does not enroll.. Freshman allowed to have car. No pets. 14% of students live on-campus. 6% of male students live in fraternities. The average student pays $10,815 for tuition, fees, and other expenses, after grants and scholarships. Total stated tuition is $5,688, in-state and on-campus, before financial aid. Learn more about financial aid at http://www.washburn.edu/financial-aid. Estimate the net price for you at http://www.washburn.edu/affordable. 16% of students graduated on time. The typical (median) early career salary of Washburn University graduates is $42,300, according to Payscale. Washburn University participates in the NCAA Division II for college athletics. Want more info about Washburn University? Get free advice from education experts and Noodle community members.